← Briefs for Wednesday, May 9: Afghanistan-on-the-Niger? I didn’t teach class yesterday. Normally I give a two-hour lecture on Friday afternoons, the sole weekly meeting of my “Anthropology and Development” course at Bamako’s Université des Lettres et des Sciences Humaines (ULSH). Then again, there’s been absolutely nothing “normal” about this school year where public higher education in Mali is concerned. I arrived in Bamako last August to begin the school year, and classes should have started up in October. Unfortunately, things were held up by a drawn-out administrative restructuring process that saw the former Université de Bamako split into four newly autonomous entities. First we heard that the resumption of classes would be delayed until November, then December, then January. Even after the rentrée universitaire was finally announced on January 15, I had to wait another month before I could teach my own course. On the first scheduled Friday of classes, none of the morning instructors showed up, so the fourth-year sociology students (who attend classes all day Friday and Saturday) went home at midday. The next Friday, classes were cancelled due to an angry protest in Bamako of the government’s mishandling of the rebellion. The Friday after that was a religious holiday. On February 17, more than halfway through my 10-month stint here, I got to teach at long last. Since there are not enough large classrooms at the ULSH, we meet in the amphitheater of the Ecole Normale Supériure in the Quartier du Fleuve. Officially there are over 400 students enrolled in my class, and the amphitheater at ENSup is probably big enough for that many, but I don’t think we’ve had more than 250 students in the room at any one time. Since that first day twelve weeks ago, class has met for six Fridays, and has not met for another six. Reasons for not meeting have been entirely beyond my control, and have included the March 22 coup d’état, a blackout, midterm exams, and most recently the violence of the April 30 “counter-coup” and its aftermath. A week ago the government declared that all schools in Bamako, from the primary to the university level, would remain closed to head off potential unrest, and we just heard this evening that they will reopen this Monday, May 14. The worry now is that classes have been delayed too long for course work and exams to be completed, and that the government will have to declare another année blanche — a d0-over, meaning students will have to start the school year over again in October. There have been several années blanches in recent years. The university system here faces a host of challenges. One is the lack of resources: there are over 100,000 students in the various branches that used to comprise the University of Bamako, but fewer than 1000 faculty members and nowhere near enough classrooms. With such outsized classes, the only way to evaluate students is through exams, and with hundreds to grade for each class, and no assistants to help, instructors often give one final exam in which students must synthesize what they learned from the entire course into a few hundred words. In light of all the things the public university in Mali lacks, I’m not sure we even can consider it a university at all. Professors teach there, and students attend classes, but not enough learning takes place. Some of my colleagues tell me they don’t expect more than 10 percent of students to understand what’s being taught. Part of the problem is that public schools at the primary and secondary level have been so dysfunctional in recent years that even those lucky enough to pass their baccalaureate exams at the end of 12th grade — a tiny fraction of all students who begin primary school — often arrive at university without the basic skills necessary to succeed. On top of under-resourced professors and under-prepared students, you have the problem of a highly politicized student union (the Association des Élèves et Étudiants du Mali, or AEEM) and a somewhat less politicized, but still very militant, faculty union (the Syndicat National de l’Enseignement Supérieur or SYNESUP). Both are highly prone to calling strikes, and if there’s been one bit of good luck this school year, it’s that there haven’t been strikes at my university. But without the AEEM’s active role in Bamako’s current political crisis, it’s unlikely that schools would have been shut down for the past week. When its members aren’t busy getting their skulls cracked by police, the AEEM occasionally mobilizes its own thugs to terrorize students and even university staff. Then you have the problem of systemic corruption, which spans the entire system, from instructors selling passing grades to students, to administrators over-invoicing their purchases. A branch of the university system recently purchased Toyota Prado Landcruisers for 55 million CFA francs each (US$110,000! ), well over their market value. I wonder how anyone could justify such a purchase as an appropriate use of scarce public resources in a context where students don’t have books to read. Politics, higher education, and plots are increasingly interwoven in Bamako. Of course there’s the AEEM, which has taken a stand against Mali’s ruling CNRDRE junta and whose leaders are often suspected of being manipulated by shadowy politicians. Then, as I mentioned in my previous post, a rector of one of Bamako’s newly autonomous universities was arrested earlier this month and remains in detention. One recent article in the Malian press claims he is suspected of having weapons. I can’t say I know the man well, and I’ve never discussed politics with him. But I just can’t believe that he’s been hiding a weapons cache any more than I’d believe my own department chair at Lehigh was an Al Qaeda sleeper agent (hi Judy!). It’s tempting to think that the challenges described above are merely growing pains that will abate as Mali’s public higher education system matures. Given how entrenched many of these problems are, however, I think it’s more realistic to expect more strikes, more années blanches, and more unrest to come. Unless Mali’s new government decides to make a serious investment in its universities, the long decline of these institutions will continue. This won’t bother the Malian elite, who can afford to send their children to private universities here or abroad. But it will be a tragedy for the majority of Malians who, despite their lack of means, hope to send their children to university someday. Postscript, 18 March 2013: Professor Isaie Dougnon, an anthropologist affiliated with the same department for which I taught while in Bamako, has published a scathing critique of Mali’s higher education system on the website University World News. 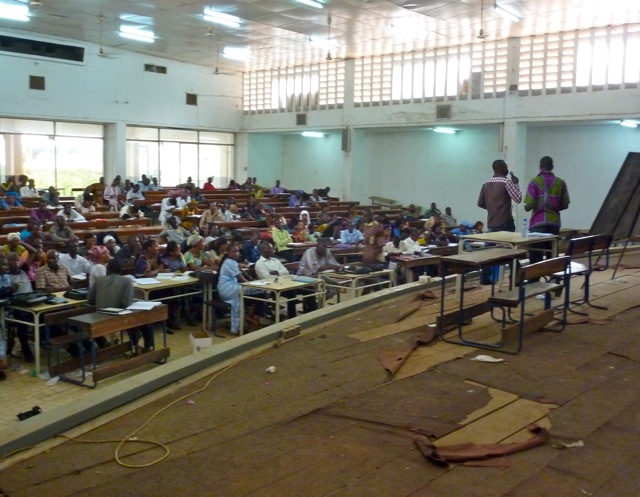 Postscript 3, 25 August 2013: The French website Rue89 has published a scathing investigation of conditions at the various University of Bamako campuses, detailing under-resourced departments, the sale of grades and degrees, and widespread fraud. This entry was posted in Uncategorized and tagged bamako, cnrdre, corruption, education. Bookmark the permalink. I heard today there is military movement in the Dogon country. Would you have an idea what this means? Will the gouvernement finally start to move forward info the rebel area? Would that be wise without aid of foreign troops? I’ve heard nothing about it. The junta doesn’t seem focused on the north (other than the occasional rhetoric) and there’s been no talk of mobilizing to retake the north. Maybe they’re just really good at hiding their true intentions? Your overview of the state of the Université de Bamako (or whatever it is called now) is excellent. I sent it to my PhD supervisor to “prove” to her how I hadn’t exaggerated the difficulties faced by students there and by researchers visiting. However, I would like to point out, to the credit of the University, that I was able to retrieve, with the help of the librarian at the École Normale Supérieure, 2 of the 7-8 masters thesis written there and which I was looking for. Not a great average but nonetheless, I got something out of that library. My thoughts go to Dr. Berthé, a charming man who I also have a hard time seeing as some dangerous conspirator. And thanks to you, for your posts which are definitely among the most informative pieces out there on the current events happening in Mali. Thanks Emilie – I’ve also used the ENSup bibliothèque, as well as the one at ENA, to find student theses. They’re actually useful for those of us doing research on Bamako: since sociology or anthropology students here often don’t have the means to do fieldwork for their mémoires in remote locations, a lot of them write about their home communities, with Bamako being by far the most common setting. So those “libraries”–and I use the term loosely–do serve that purpose. But I don’t know of any equivalent of these resources, as limited as they are, at the ULSH or any other part of what used to be the Université de Bamako. The theses written for the Sociology or Anthropology departments, for example, are completely unorganized in stacks cluttering up the faculty room! The only way to find one in particular, I was told, would be to pay someone to go through them all. I decided not to bother. Emilie, as far as I’ve heard from some private source, Salif Berthé has been released some days ago. Great news. Thank you, Conny. great insights bruce. thanks for this perspective into the workings (?) the university world in bamako. may better days come. Hmm, I don’t know anyone in Bamako who’s sent their child(ren) to Ghana. But many upper-middle class kids here do go to Senegal, Cote d’Ivoire, Morocco or Tunisia for post-secondary studies. I suspect language is a big factor that prevents most Malians from even considering study in anglophone countries. Merci beaucoup, Bruce, de ce résumé excellent et très instructif, pour moi, sur le système scolaire/universitaire au Mali. Quand je suis arrivée, au mois d’octobre, à Kati, j’ai vu les grèves interminables au lycée et l’année blanche universitaire déjà écoulée, ce qui affectait énormément nos enfants en terminale et en premiére année d’anglais, je me suis demandé si un jour j’allais comprendre quelques raisons du chaos, du dysfonctionnement du système scolaire au Mali (http://mali-infos.blog.de/2011/11/01/la-fete-approche-recit-de-kati-tage-vor-dem-fest-tabaski-bericht-aus-kati-12102351/). Je n’ai jamais envisagé que le processus de le découvrir soit si douloureux. Merci encore pour votre information continue sur les événements depuis Bamako que je suis par e-mail et que j’apprécie beaucoup en tant que source assez objective d’un “insider”. Et bien à lire.. When I did a year abroad as student at the Université de Ouagadougou/Burkina Faso in 2007/08 I was facing the same problems you mention. Either students or professors were constantly on strike, for a couple of weeks the governement closed the whole Uni due to so-called “violent” manifestations, and when classes did finally take place, equipment was basically not existent. Still I guess I learned more about Afica and Africans and the problems the continent is facing than I did throughout 6 years of African Studies in Germany and Austia. This is why I would recommand all students of Africa related studies to take a year off, go somewhere on your own and experience the “real” Africa, even if it you would spend most of your time with (mostly unsuccesful) attempts to organize the things you actually came for.